I should really preface this review with the fact that I love peanut butter cups – in regular form, in mini form, in ice cream form. This tea had a lot to live up to with a name like peanut butter cup. Luckily, when I first smelled the tea I was instantly reminded of the smell of peanut butter cup. It also smells a bit like vanilla, the chocolate smell is very obvious and the peanut butter, mmm! Gotta love peanut butter. Oddly enough, the list of ingredients does not actually include peanuts or peanut butter. 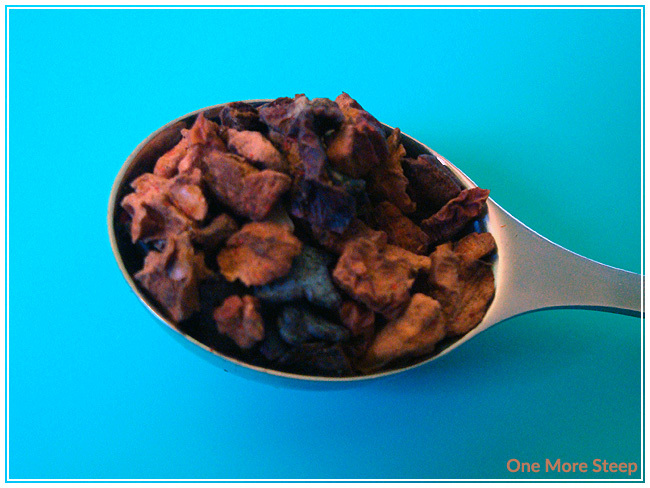 The tea consists of: apple, cocoa, almond, chocolate, safflower, artificial flavouring. Contains almonds and soy & may contain milk. 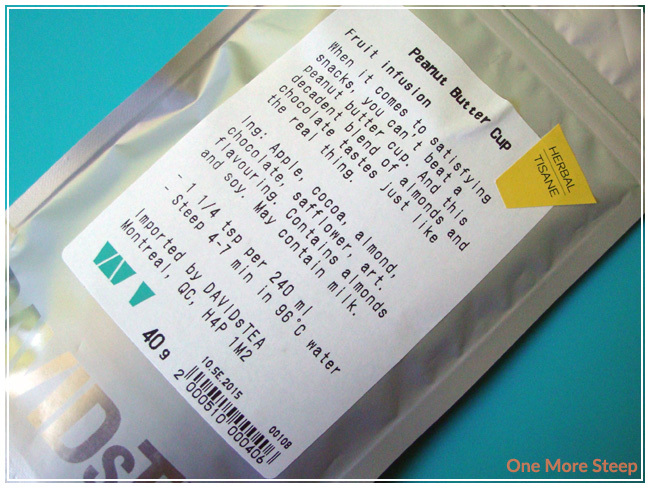 DavidsTea recommends steeping Peanut Butter Cup in 96°C (204°F) water for 4 to 7 minutes. I wound up steeping for close to 7 minutes. Peanut Butter Cup smells just as delicious as it is steeping as when it’s in the pouch. The surface of the tea does have some oil, as expected from the chocolate that would have melted when steeping. The tea itself does have an oily mouthfeel to it, thank you chocolate, and the taste isn’t quite as close to a peanut butter cup as I would have wanted it to be with the amazing smell pre- and post-steeping. The peanut butter flavour is light, and while I couldn’t smell the apple previously there is the tart taste of apple in the tea when having a sip. 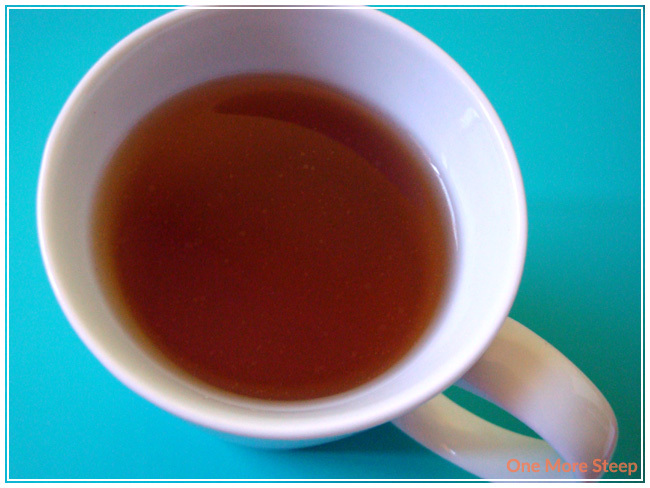 It is a little bit sweet, what with the sugars from the chocolate and the apples themselves, but the flavour of the tea doesn’t quite match up with the aroma of the tea itself. Peanut Butter Cup does not do well with a second steeping, I would not recommend that you try steeping it again at all. I thought that DavidsTea’s Peanut Butter Cup was just okay. It didn’t really live up to my expectations, what with the smell and the name and the hype that I read online about this tea. I think I may try it again in the future either steeped in milk to make a latte, or mixing it with some hot chocolate mix to amp up the flavour just a touch. As a tea by itself, steeped according to the recommendations by DavidsTea, it just didn’t meet the expectations. Flavour wise, it is okay, but it just needs a little something more. I would have it again, but not hoard it in my tea stash.